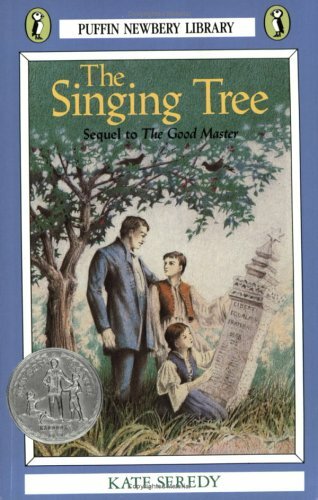 Following the recommendation of a dear reader, I picked up The Singing Tree by Kate Seredy. For those unfamiliar with the book (like I was), this is a sequel to The Good Master. It’s the story of two cousins,Kate and Jancsi, growing up in the Hungarian country side during the early part of the last century. I very rarely jump ahead in series fiction, but the whole WWI setting of the sequel caused me to skip to the good stuff (so to speak). 1. It’s set in Hungary. Which means this is a story about WWI from the other side. Bonus: the war is also not an ocean away, making certain aspects of life on the homefront much more immediate. They take in Russian prionsers of war to work on the farm. They take in orphans from Germany. They create a whole community–made by war, but as expected in a children’s book, they all find common ground and become a big family. 2. The illustrations. Though I will admit that the crayon portraits Kate and Jancsi freaked me out a bit. But the charcoal? pencil? (I am bad about artistic mediums–I only know crayon because it says so right there on the page) are amazing. Soft and lovely and evocative. I just wanted to soak them up. 3. Wonderful characters. Kate is a little spitfire (though I wish there had been a bit more about her, somehow). Uncle Moses is a wonderful character too–the way his mind works in his store! 4. Beautiful imagery. Near the beginning of the book, the kids are told the story of hte poplar lane. There’s a monument there to the 1848 revolution. Kate’s father explains to the children: “Your great-grandfather Marton Nagy was one of the last great feudal landlords. Moses Mandelbaum, grandfather of Uncle Moses, was one of the first Jews who opened a store under the new laws. And this avenue of trees’ –he pointed ahead into the green lane–‘had been planted in March 1848, one tree by every one of those whose names you have just read. The former master, who was one of his people now, all the peasants, who were now his equal in rights, and Moses Mandelbaum, they each planted a tree. A green, living thing to grow and remind them always that they were brother Hungarians, first and last.” It’s a simply beautiful scene, even with the shadow of war hanging over it. And then the image of the Singing Tree itself at the end of the book. Well, I’ll let you discover that yourself. 5. A taste of Hungary. There were lots of little mentions of cultural traditions that I really enjoyed. The description of the wedding traditions was fascinating (and sounded quite exhausting!). Children’s books are such a great, non-threatening way to introduce other cultures. All that being said, I didn’t love this book. Oh, I liked it. But the emotion that’s in Rilla or even Betsy just wasn’t there. And I admit it–I like emotion with my history. The war certainly affects them–fathers go off to war, a neighbor runs away from the army to see his child (and must be hidden), young people are forced to grow up more quickly. But something is just missing. I did a small amount of digging on Kate Seredy, trying to figure out where history and biography overlap. Some of the connections are pretty obvious (hello! Kate and Kate!). In real life, her father was also a teacher. She spent time on the land. But what kills me is that she was a nurse during WWI. She had been studying art in Budapest (the fictional Kate is still at home) and according to the online biography at University of Oregon (which holds almost all of her Caddie Woodlawn illustrations–another kidlit history connection! ): “When World War I interrupted her studies, she served as a nurse and studied anatomy sporadically “between bouts of patching up anatomy.” Now what an amazing book that would have been! Kate would have been quite young when the war broke out (she was born in 1899)–can you imagine a coming of age story with battlefield nursing as the central plot? I think I would find the emotion I was perhaps missing in The Singing Tree. There were certain aspects of the book that seemed heavy-handed–the “we’re all really the same–this disagreement is not between the people, but the rulers. . .” Which is to be expected from a book written by a former “enemy,” now living in America. But there’s even more resonance to this theme when you flip to the front of the book and see the original publication date: October, 1939. As Seredy was writing, war was again brewing. In 1940, as war was raging, it was named a Newbery Honor Book. This extra bit of context makes the story all the more meaningful. Not enough to make me fall in love with Seredy, but definitely enough for me to respect her. And add her to the list of Kidlit Historians.